The Haywood Street house – just how old is it? The story of this house is well known: it was built in or about 1858 and saved from demolition by Dr George Emery (1923-2005), who had it removed from its original location above Moray Place (off View Street) and reconstructed on the lower part of his property in Haywood Street, Mornington. A fine house for such an early date, it really is a marvel of settler craftsmanship. It also has an interesting history of occupation, with those who lived in it including the medical superintendents Edward Hulme and Isaiah De Zouche, and the art dealer Ambrose Chiaroni. It has a Category II registration with Heritage New Zealand. A question has been niggling me though: was it really built in 1858? 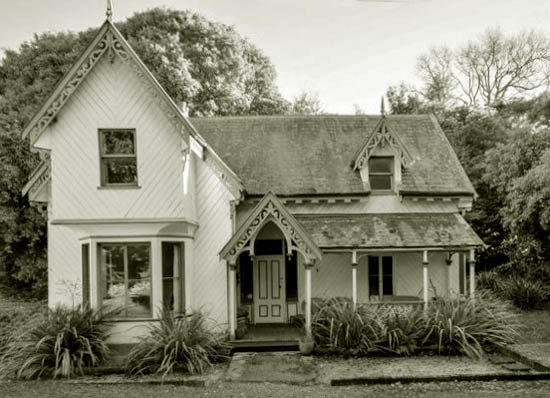 I recently attended a very interesting and well-researched talk by Peter Entwisle at the Otago Museum: All Shapes and Sizes – Domestic Architecture in Victorian Dunedin – The Colonial Bay Villa. I won’t summarise the talk here, but the Haywood Street house proved an intriguing and difficult example to place in the development of Dunedin’s domestic architecture, as the pre-gold rush date seemed at odds with a number of its features and influences on local design at the time. Rather than trying to reconcile the style of house to the year 1858, I’ve been wondering if the building has been misdated. Dr Emery did much good research himself, as did Lois Galer, and early rates records suggest improvements on the site around 1858. The new information I am throwing into the mix is photographic evidence, which suggests that the house as we know it was in fact built a few years later. The image below is dated 1862, and this is confirmed by the presence of the Theatre Royal in Princes Street and the original Otago Boys’ High School under construction. 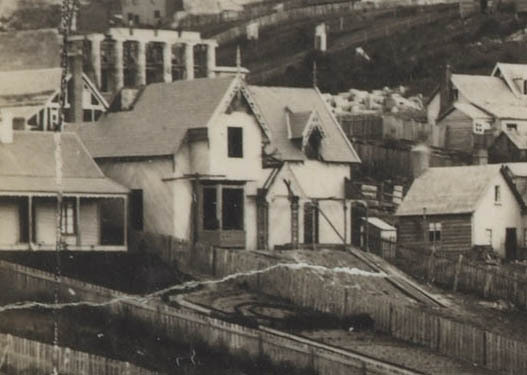 It has been used to illustrate the history of the house before, but through the digital technology of Te Papa’s Collections Online it is possible to zoom in on the detail and discover more. The detail shows the verandah to be only partially constructed, an incomplete chimney, window openings without joinery or glazing, and the general appearance of a building site. An earlier cottage may well have been incorporated into the structure, but it seems that the house in its final form was under construction in the middle part of 1862. This is only four years different from the established date, but they are a significant four years in terms of Dunedin’s history, as they place the house in the thick of the gold rush period rather than ahead of it. It would be interesting to re-investigate the history of the house in the light of this knowledge, taking another look at the land records. This may be of niche interest, but because of the house’s established status as a ‘forerunner’, from an historian’s point of view it’s well worth the trouble of putting it in accurate context. This little detective exercise is also a good example of the value of institutions making high-resolution copies of images available to researchers. Thank you Te Papa! 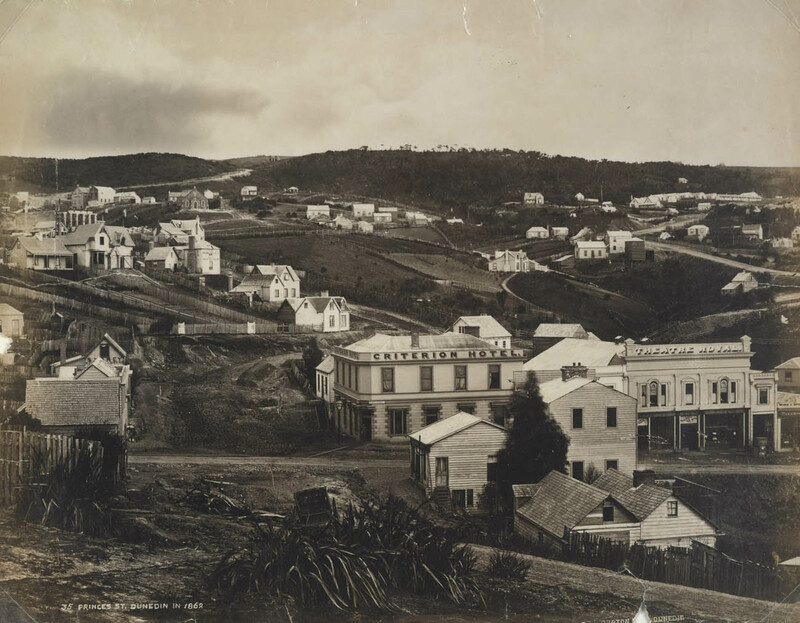 ‘Princes Street, Dunedin in 1862’. Te Papa O.000858/01. This entry was posted in Buildings and tagged 1850s, 1860s, Haywood Street, Moray Place, Mornington, View Street on 30 June 2014 by David Murray.